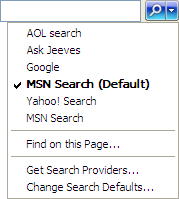 When I installed Internet Explorer 7on my PC, I found that the default search engine is set as MSN Search. I have to change the default search engine to Google. Can I change it to Google? You should first open the Internet Explorer and click on the ‘Tools’ option located at the top of the screen. You should click on ‘Internet options’ afterwards to view ‘Internet options’ dialog box. By clicking on the ‘General’ tab, you can view ‘Change search defaults’ option along with ‘Settings’ button. You should first click on that button and then on ‘find more providers’ option at the lower part. You will be then redirected to ‘Add Search Providers to Internet Explorer 7’ page where you can add Google by specifying URL and name. On clicking ‘Install’ button, you will be asked for confirmation to add Google to Internet Explorer 7. You should then click on the ‘Add Provider’ button available. Then, you should again click on the ‘Settings’ button near ‘Change search defaults’ option so that you can view ‘Google’ in the given list. After that, you should select the ‘Google’ option and click on the ‘Set as Default’ button to set it as default search engine. It is very simple to do so. Select Internet Options under Tools tab. Type www.google.com under home page and hit OK. Follow the recommended settings to keep google as default browser. Now this will be your default browser in internet explorer 7. 3.Click on the button SETTINGS in SEARCH. 4.There you will find FIND MORE PROVIDERS a small lettered in bottom of that window. 5.you will be directed to a web page ADD SEARCH PROVIDERS IN INTERNET EXPLORER 7. 6.There you can select your default search engine add to default engine. Hiiii..To change your default search provider follow the below steps..
1-Open Internet Explorer by clicking the Start button , and then clicking Internet Explorer. 2-Click the arrow to the right of the search box. 3-Internet Explorer 8 search boxClick the search provider would like to use. 4-In the search box, type the word or phrase you want to search for, and then press ENTER. 5-That search provider will be used until you close Internet Explorer. When you restart Internet Explorer, the default search provider will be used. To make internet explorer as your default. Just re install it and while installing it. You will be asked if you want internet explorer to be your default browser. And that will make internet explorer your default browser. 1)Open Internet Explorer by clicking the Start button , and then clicking Internet Explorer. 2)Click the arrow to the right of the search box. 1 Open Internet Explorer by clicking the Start button , and then clicking Internet Explorer, or you can start it from the shortcut at your desktop, or in quick launch bar. 2 Click the arrow to the right of the search box. 3 click the search provider you would like to set as the default, click Set Default, and then click OK.and its all done,,, you have changed your default search provider in IE7..
1.Install and update Internet Explorer,if you have not done so already. 2.Click on the search options button in the upper right hand corner of the screen at the end of the Navigation toolbar.Select "Find More Providers". 3.Once you arrive at the Add-ons gallery:Visual Search,browse through the selections and decide which search providers you wish to install. 4.Click on the button that says "Add to Internet Explorer" to add the search provider to Internet Explorer. 5.A pop up will appear that asks you if you want to install that search provider.If you know you want to make that search provider your default search engine,click on the box next to "Make this my default search provider".Otherwise,leave it unchecked.Then click "Add". 6.Once you have added on any additional search providers,click on the search providers,click on the search options button again.This time,select "Manage Search Providers". 7.Highlight the search engine you wish to set as the default and click on the "Set as Default" button in the lower right hand corner of the box. It is simple and to change the Browser. you have o follow some of the few simple steps. 1. open the internet browser by clicking the start menu. ->First go to internet explorer and there top you can able to seen the tools option click on it. ->By clicking on it go for internet options. options including google select it and continue.it's smple..! 1. Clicking the Start button. In the search box, type Internet Explorer, and then, in the list of results, click Internet Explorer. 2. Click the arrow to the right of the search box. 3. Click Manage Search Providers. 4. Click the search provider you would like to set as the default then click Set as default, and then click Close. yes you can change the default search engine as google instead of bing!!! "TOOLS" then click on "INTERNET OPTION"
Tap on Start & Go Internet Explorer. then select it -> click "ok"
If you want to know that how to change the default search engine on internet explorer 7.. So i can give you some easy steps to sole this problem..
Just see have a look..
1.First of all go and start the internet explorer and go into internet option under the tools tab..
2.After that type www.yahoo.com under home page and then click OK.
3.Just follow the recommended setting to keep yahoo as a default browser. Click on the Internet explorer and open it,You need to click the arrow at the right side of the search box, and then click Manage Search Providers, and select the google.com, Set it Default and close the option. You can re-install the internet explorer, while re-install you will find the option of default search engine , type google.com and save the settings. In general tab you can change default search engine like google,yahoo,bing etc. 1. Click the Tools icon in the top-right corner of Internet Explorer. 3. Choose Search Providers in the left pane of the box that appears. 4. Click the name of the search provider you’d like to make the default, and then click theSet as default button in the bottom right. 1. Click the Find more search providers… link at the bottom left to open the Internet Explorer Add-ons Gallery. 2. Click the Search link on this page, and type the name of the search engine you wish to add. 3. Click the result you want, and follow the instructions to add it. Changing default search engine to your preferred search is very easy in window 7 operating system! For Setting Default search engine Follow these steps..
Changing the default search engine on Internet explorer 7 is a very easy process. --> First Launch " Internet Explorer "
--> Then Click on " Tools " followed by " Internet Options "
--> This will direct you to a web page " Add Search Providers in Internet Explorer 7 "
--> Then at last save the Required settings by clicking on OK. Thus you can change Default search engine on Internet Explorer 7.
to change the default search engine just fallow these steps. -a new tab will open now in 'general' option you can change the default search engine. -by selecting new click on ok.
2.Then you go to the 'Internet Browser'. 3.Then you go to the option 'Tools'. 4.Then a sub-menu will open there you click on 'Internet Options'. 6.Then you go to the 'General' tab. 7.Then you type the webpage address near 'Home Page'. IF YOU WANT TO CHANGE YOUR DEFAULT SEARCH ENGINE IN INTERNET EXPLORER THEN DEAR FOLLOW MY INSTRUCTION AS ARE BELOW. > Dear first open your internet explorer. > Now choose the tool option at the top. > Now choose the internet option after choosing it a internet option dialog box will appears. > Click on general option in this dialog box after that below you got the website address written under the heading home page. > Here you can write the website address that you want to set as default and after writing click on the option "USE DEFAULT". > Now click on apply and after that ok.
> Your default search engine is successfully changed. there are many search engine for internet access.Each user choose the different search engine according to their choice ans make the special search engine as a default search engine. there are google , bing , yahoo , ask , MSN etc.you can make any search engine as a default search engine in any browser. now you also want to change your search engine in internet explorer 7.now you have MSN search engine as a default search engine and want to shift to other search engine. you can surely change your search engine from msn to other search engine. --> now you will see the arrow at right side of "bing"
--> select "manage search default"
--> now select the your choosen search engine which you would like most. --> click on "set as default"
you can easily crack this problem. After that go for option. and then change your home page. It is very easy to change Default Search Engine in Internet Explorer 7. Firstly, open the IE from the Start Menu. From here, choose Tools Menu from the Menu Bar. Now, choose Internet Options from the drop down menu. Here, from the General Tab, choose Google.com as the Default Search Engine. Finally, click on OK button to Finish it. I will help you to solve your problem just follow my instructions. 1.Firstly make your Internet Explorer open. 3.Then go to the Menu bar and tap on 'Tools'. 4.Now tap on the option of 'Internet options' under the tools menu. 5.From there you navigate to the 'General' tab. 6.There under 'Home Page' you can see the address what you are using there you tap on 'Use Current'. >>Click on "set as default"
Click the Tools icon at the far right of the browser window. In the General tab, find the Search section and click Settings. Select Make this my default search provider in the confirmation box that appears, then click Add to close the box. 3th----Click on the button SETTINGS in SEARCH. 4th----you will find FIND MORE PROVIDERS a small lettered in bottom of that window. 5th----.you will be directed to a web page ADD SEARCH PROVIDERS IN INTERNET EXPLORER 7. 6th-----you can select your default search engine add to default engine. It is easy to make google as a default search engine , you just follow the below steps so that you will find the solution . => In that on the menu bar there will be option " Tool " click on it . => On that select the option " Internet Options " . => A new window will be displayed in that select " General " option . => In that write the google address in home page text box . Now when you open the IE google will be your default search engine . 1. Open Internet Explorer by clicking the Start button , and then clicking Internet Explorer. 1. In Internet Explorer , click Manage Search Providers. 2. In Internet Explorer 7, click Change Search Defaults. 3. In Internet Explorer 8, click the search provider you would like to set as the default, click Set as default, and then click Close. 4, In Internet Explorer 7, click the search provider you would like to set as the default, click Set Default, and then click OK.
first of all Go to TOOLS>INTERNET OPTIONS. than please Click on the button SETTINGS in SEARCH. after all There you will find FIND MORE PROVIDERS a small lettered in bottom of that window. now please wait than you will be directed to a web page ADD SEARCH PROVIDERS IN INTERNET EXPLORER 7. Now the default search is changed to Google in the Internet Explorer. Steps to set the default zoom in Internet Explorer 8 in windows 7 professional?